The GT 330 A Series is a eutectic cast iron 3-pass, high efficiency, large net output, low operating temperature, designed boiler. These boilers are specifically designed for oil / gas / propane firing. The GT 330 A is equipped with a simplified control panel with built-in on/off limit, high limit, manual reset limit and temperature gauge. Low Water Outlet Temperature down to 85°F with indoor/outdoor reset achieves significant energy savings by reducing stand-by fuel consumption. In addition, it’s not necessary to maintain boiler temperature between the two heating cycles, which further reduces fuel consumption and achieves excellent overall efficiency. 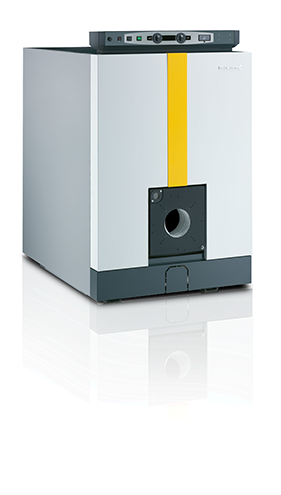 Studies show substantial savings over retrofit boilers and over new competitive models. Easy Cleaning with Hinged Door for burner and flue access. Doors can be hinged right or left based on your access needs. Boiler is easily cleaned and vacuumed, resulting in lower maintenance costs. Control Panel. The standard control panel supplied is designed for heating only. The panel is equipped with a boiler thermometer, on/off limit, high limit and manual reset limit. The large size permits it to be integrated easily with third party energy management systems.